Punjab National Bank, the country's second-largest public sector lender, has detected fraudulent and unauthorized transactions worth Rs 11,360 Crores, at one of its branches in Mumbai. This is one of the biggest corporate frauds in India and the value of the scam is more than 8 times PNB's annual net profit of Rs 1,324 crores during FY 2016-2017. The bank has filed a complaint with the Central Bureau of Investigation (CBI), against diamantaire Nirav Modi, and a jewelery company, which cheated the bank to the tune of Rs 11,360 crores. 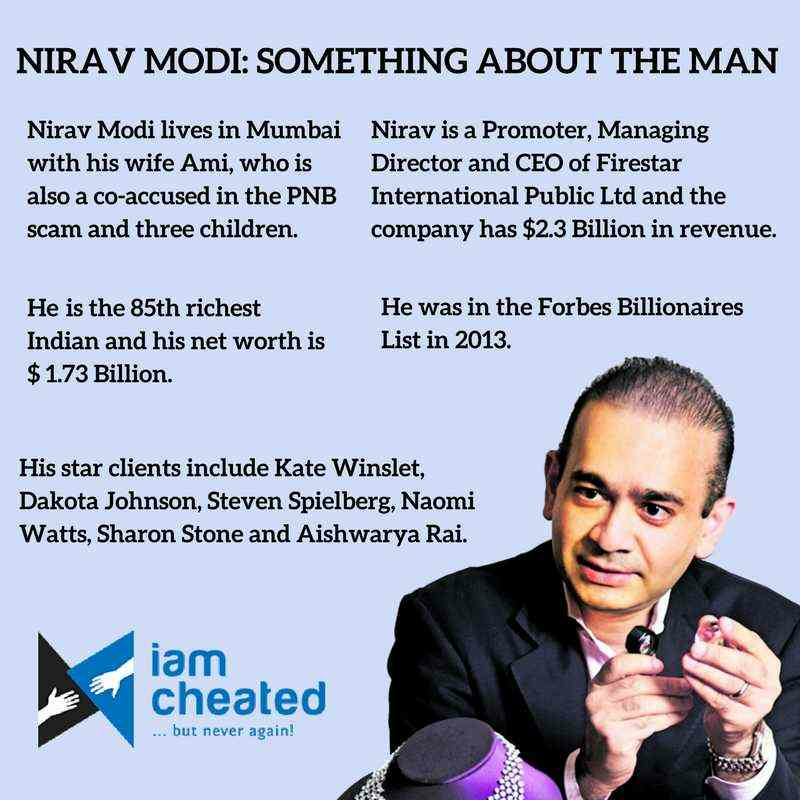 Nirav Modi is 48 years old and he is from a family of diamond brokers in Antwerp, Belgium. Nirav grew up at Grosvenor House, Pedder Road in Mumbai and also at Antwerp in Belgium, which is the diamond trading capital. He is married to Ami Modi and has three children. Nirav Modi joined the Wharton Business School, studied Finance for a year and then dropped out. Later, he came back to India and learnt the diamond trade. Nirav is a Promoter, Managing Director and CEO of Firestar International Public Ltd and the company has $2.3 Billion in revenue. Nirav Modi launched the Nirav Modi brand in the year 2010. Nirav Modi group, is an integrated diamond manufacturer that buys rough diamonds, sells polished stones and also makes jewellery. The prices of the jewelery pieces range from Rs 5 Lakhs to Rs 50 crores. Nirav Modi is the 85th richest Indian and his net worth is $1.74 billion. His star clients include Kate Winslet, Dakota Johnson, Steven Spielberg, Naomi Watts, Sharon Stone and Aishwarya Rai. Priyanka Chopra, a Bollywood star and a former Miss World, is his Global Brand Ambassador. Donald Trump inaugurated his first store at New York's, Madison Avenue, in 2015. Nirav started amazing boutiques in Big Commercial Districts like Madison Avenue, New York, USA and Bond Street in London's West End.